by filmmakers John Little and Kenn Little, enrolled members of the Standing Rock Sioux Tribe. 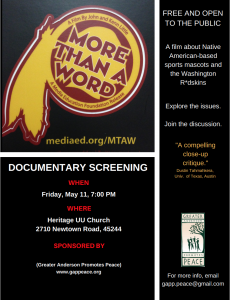 The film offers a fascinating look inside the movement to change the name of the Washington R*dskins football team. The film traces how the word “r*dskin” evolved from a term of slander to being embraced by the NFL franchise. It also draws on the voices of Native American activists and scholars to place the controversy surrounding mascots within the wider context of Native American history and racial stereotyping. This “culturally relevant project from an indigenous perspective” offers an educational opportunity to better understand many aspects of this issue in our local community.